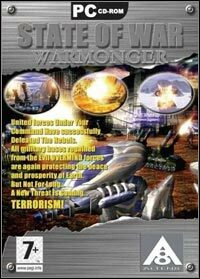 State of War: Warmonger is a fully-fledged sequel to the real-time strategy (RTS) called State of War, which premiered at the beginning of 2001. State of War: Warmonger is a sequel to original real time strategy State of War. It was designed as a stand alone version. Warmonger includes 16 bright new missions in which 11 are singleplayer and 5 multiplayer. Beginning as small groups of devoted individuals terrorist groups begun to emerge. Their members did not want peace on Earth. Most influential among them was Crystal Brotherhood. Mr. Rahman a member of OVERMIND activator has betrayed. He has joined the Crystal Brotherhood and sold them most vital information - activation codes along with his own soul. Now all bases are ready to face the terrorists and your duty calls you again to command the united forces of UFSC and Mr. Rahman is to blame for the need to declare once again State of War!!! * Massive destruction, debris flying everywhere. * Advancer unit changing the course of the gameplay radically. * Realistic natural effects of smoke, clouds or flares. Game score 8.4 / 10 calculated out of 103 players' votes.